Taken by John Phillip O’Brien. Missing On Sickles Street: The Most Amazing Cat Ever! And a visual aid attesting to the previous is provided by his “person”. 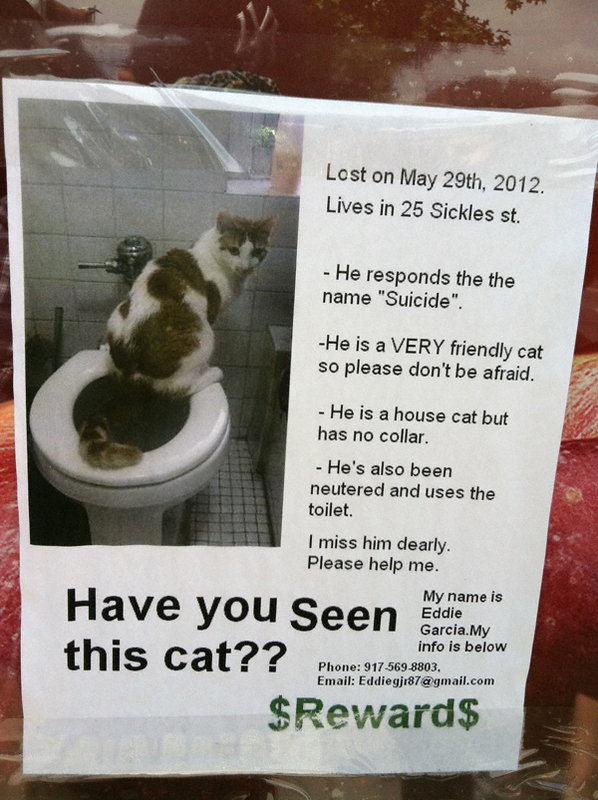 If anyone in the Sickles Street area has seen Suicide (who, it should be noted is neutered and bereft of a collar) or knows of his whereabouts please contact his person, Eddie, at the above-listed phone number or email address. He is clearly missed. Let’s help this fine furry fellow get back home! Special thanks/props go to the amazing Steven R. Hazlett for giving me permission to share this find! Some kids go home after school to play video games, while others go out to work.